This Redmond kitchen refresh was a joy. Need of a new stove created this project, and as we have seen many times, one change leads to another. This customer was able to observe their dream coming to reality. Since the kitchen cabinets were well built and did match the sponge paint on the wall they remained. While selecting granite for a fireplace face, the customer fell in love with a granite countertop they could not pass up. One interesting note on the finished countertop, is trying to locate the seam. To complete the countertop the customer selected a Kohler faucet and a 16 gauge IPT sink. 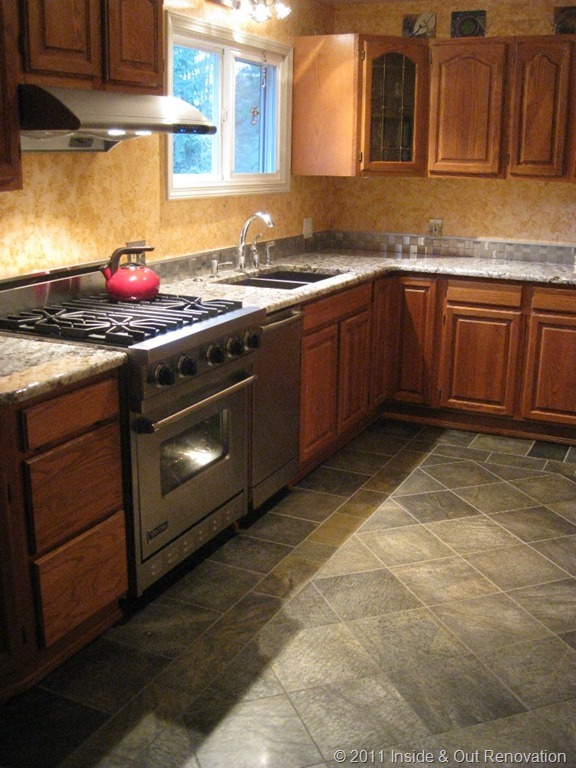 One of the original projects in the kitchen was going to be the floor. Due to very high heating bills the customer wanted a fireplace for zonal heating and a heated tile floor in the kitchen. 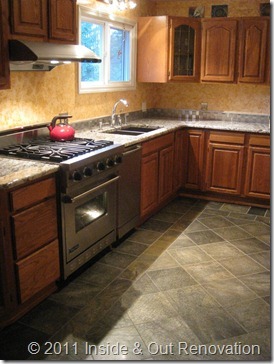 A Carbonic heat mat was installed under slate tile and now, bare feet in the kitchen are no problem. A personal opinion, the Viking stove does go quite nicely with the granite counter and slate floor.